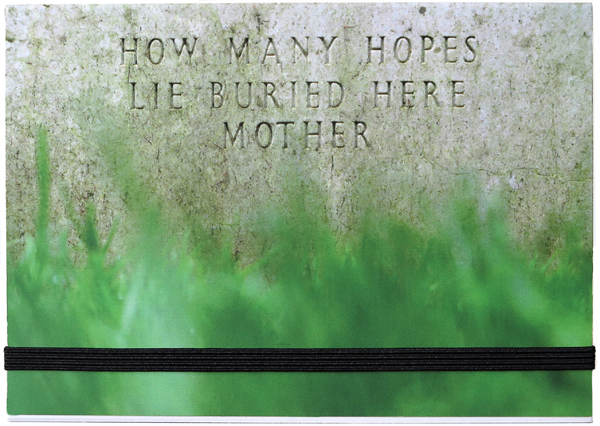 On Sunday 31 July Roelof Bakker from Negative Press London launched his photo book HOW MANY HOPES LIE BURIED HERE MOTHER at the grave of Canadian soldier James Carter Irwin in Nunhead (All Saints) Cemetery in south London. He delivered a short remembrance speech and laid flowers on James’ grave in the company of close friends. The photographs in the book show ages on headstones in war cemeteries tended by the Commonwealth War Graves Commission. The book is dedicated to James Carter Irwin and his mother Jennie Carter Irwin. The speech is reproduced here. Since 2007 I have been working on a project photographing ages on headstones of fallen soldiers in cemeteries tended by the Commonwealth War Graves Commission. I have photographed in cemeteries around Ypres in Belgium, municipal cemeteries in London and in Arnhem/Oosterbeek war cemetery near where I grew up in Holland. I’ve come to Nunhead cemetery a number of times since 2008 and the first time I was here I noticed the epitaph on James Carter Irwin’s headstone and photographed it. These words kept haunting me over the years as I visited other war cemeteries and I came back several times to photograph this headstone. It slowly dawned on me that the epitaph summed up what my project was about, what I was trying to express. Once I decided to take these words HOW MANY HOPES LIE BURIED HERE MOTHER as the title of my photo book and project, I wanted to find out more about the person whose gravestone this was and who it was who had supplied the wording for the inscription. James Carter Irwin was a seventeen year old Canadian bank clerk from Ontario, who lied about his age when he enlisted the army in 1915. He joined the Princes Patricia’s Canadian Light Infantry in the field on 30 May 2016 near Sanctuary Wood in Ypres and was seriously wounded on 2 June 1916. He was taken to the UK to King George Hospital in Stamford Street, SE1 where he died on this day 100 years ago aged eighteen. His mother Jennie Carter Irwin, instructed the inscription, asking the question herself, How Many Hope Lie Buried Here? (signed) Mother. We will never know, but I want to remember James and his mother Jennie today as I am now involved with them, they’ve inspired me, and as they’ve both become a part of my project I have dedicated the publication to both of them. I feel honoured to lay these flowers on James’s grave and to pay tribute to both him and his mother. Thank you James, thank you Jennie and thank you all for being here today.